John Frederick Herring,Snr was born in Surrey in 1795, the son of a merchant. At the age of nineteen, he moved to Doncaster and married Anne Harris. His three sons John Frederick Herring Jnr, Charles and Benjamin all became artists. He initially earned his living painting coach insignia and was also a coach driver. During his spare time, he produced portraits of hunters and racehorses for the gentry, gaining him recognition as the ‘artist coachman’. He exhibited at the Royal Academy from 1818-1865 and also exhibited at the British Institution and the Society of British Artists. Herring moved to Newmarket in 1830, before moving to London in 1833. Around this time, he is believed to have received tuition from Abraham Cooper and Sawrey Gilpin. His real success came in the early 1840’s after W T Copeland commissioned a number of paintings and designs for Spode china. In 1840 Herring was commissioned by the Duc D’Orleans to paint several pictures and in 1842, he became vice-president of the Society of British Artists. 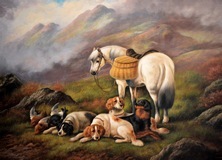 Further success came in 1845 when he was appointed Animal Painter to HRH the Duchess of Kent, followed by a commission from Queen Victoria who remained a patron for the rest of his life. In 1853 Herring moved to Meopham Park, Tonbridge where he died in 1865. Figaro was bred in 1818 by Joseph Rogers. 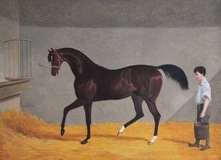 He won the Oatlands Stakes, Newmarket in 1823, and the Doncaster Cup in 1823. Came 2nd in the Epsom Derby, Thursday 23 May 1822, to the Duke of York’s “Moses”, loosing by just a head. Sire – Dam – Dam’s Sire: Haphazard – mare by Selim. Family no. 11, from the Byerley Turk Sire Line. Sired to Hon Pawlett Orde. Provenance: Sir Herbert Ramsay, 5th Baronet of Balmain. Christie's sale 22 May 1914, lot 74, purchased by Mr Hamilton Brown. Christie's sale 26 February 1954, lot 100, purchased by the late Mr Anthony S Till FRCS & Mrs Joan Till, Holwell House, Oxon.